Adelaide Airport's taxi rank system needed improving. 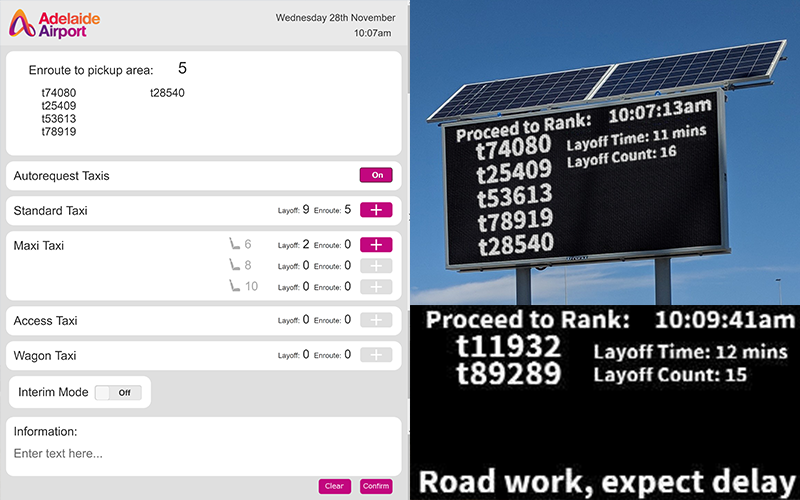 SAGE Automation delivered a Variable Message Sign to display expected wait times and to call specific taxis to the rank based on type. Digital taxi marshaling solution provides more efficient movement of vehicles and better service for passengers, drivers and airport. Variable Message Sign (VMS), Addinsight Omnia, Representational State Transfer (REST) interfaces, user-friendly iPad interface. 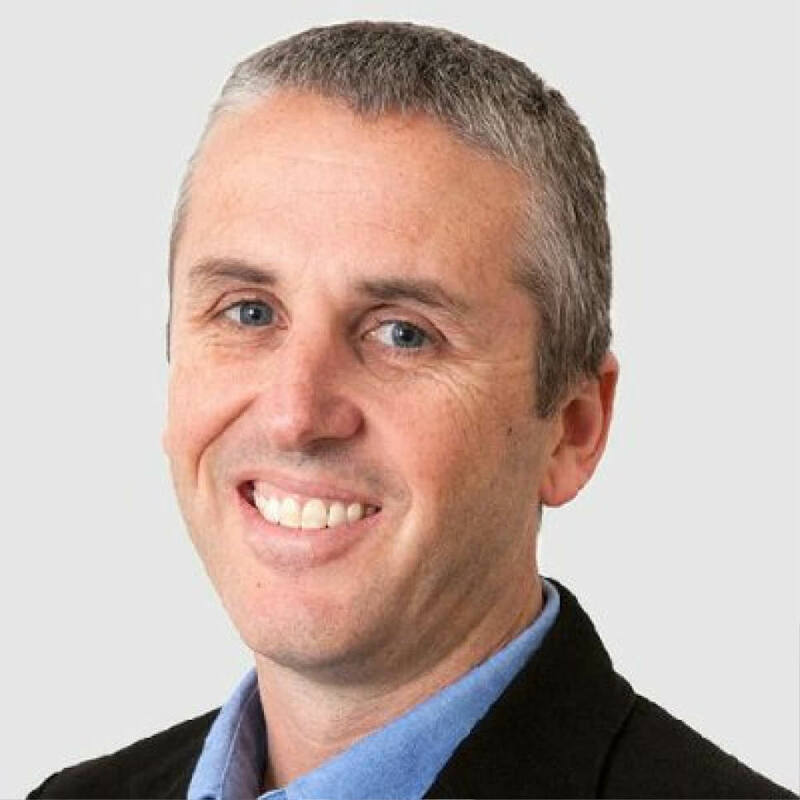 "Managing traffic flow in real time is critical. This technology has connected the new on-ramp to the M2 to deliver greater productivity for commuters". Adelaide Airport is the fifth-largest domestic airport and sixth-largest international airport in Australia and processes more than 8 million passengers annually. The airport offers ride share, taxi and public transport services for newly landed passengers. In order to best serve domestic and international arrivals, taxis must be rapidly available at the terminal. Additionally, many passengers require different types of taxis to cater for large groups, excessive luggage or disability access. A minimum of two employees would run the taxi rank: one taxi marshal at the rank managing the line-up, the other at the taxi layoff area. The rank marshal would radio the layoff marshal to request taxis according to demand. The system had room for improvement; the layoff area marshal would have to walk the carpark to find requested special access taxis, and as such the service could be delayed. Plus, taxi drivers had no knowledge of the queue time in the layoff area. The system was also dependent on two marshals being present at all operating times. SAGE was engaged to deliver a solution that would improve the taxi rank’s responsiveness for passengers and the drivers. Through a user requirements workshop, SAGE developed the proposal for the Variable Message Sign (VMS) and digital marshalling system solution. 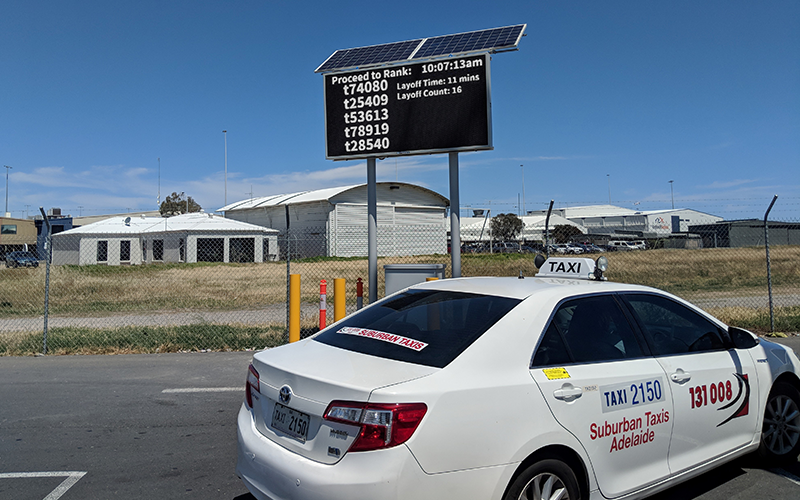 A VMS stationed in the taxi layoff area displays the expected wait time and calls specific taxis to the rank based on their type and how long they’ve already been waiting. Meanwhile at the rank, the marshal is equipped with an iPad that displays how many taxis are waiting, their type and capacity. The marshal can request specific taxi types using the iPad, with the knowledge there are reserves in the rank, should they need more. SAGE provided an end-to-end solution that included: user requirements gathering, design, programming, control panel and Addinsight unit manufacture, site installation, testing and service support. The airport’s taxi rank system now benefits from a VMS and digital marshalling system. Taxi drivers and marshals now have full visibility of wait times, taxi numbers and types, and as such can respond to demand appropriately.